Malout, Bathinda: A court in Malout has reportedly sentenced a man to undergo 2 years imprisonment for hurling shoe at former chief minister Parkash Singh Badal. Gurbachan Singh had hurled a shoe at Parkash Singh Badal at village Ratta Khera during an election rally on January 11, 2017. A case was registered against Gurbachan Singh at police station Kabarwala u/s 353, 355 and 186 of Indian Penal Code. A report in a Punjabi vernacular notes that Gurbachan Singh is brother of acting jathedar Bhai Amrik Singh Ajnala. 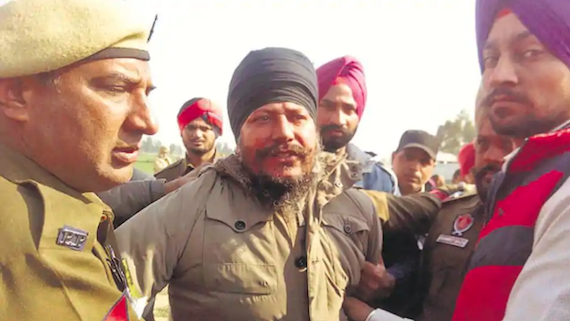 Gurbachan Singh had hurled the show to show his anger against the then CM for his role in allegedly protecting the culprits of the beadbi incidents.